Have you ever come across somebody who seems like they ‘have their gloves on’? You know… when someone has their gloves on…. They’ve been caught up in that snow storm of their own ego-thinking: innocently believing it to be real. They’ve got those gloves on, and are just waiting for you to hop in the ring with them… waiting for you to entertain their reality… waiting to take it to the next level. The irony of it… well I had not read anyone else’s comments but was inspired to share my own reflection. I mentioned how it reminded me of separate realities, and how amazing it is how we often see in our own perspective. Then ding ding… or rather ping ping! Someone I didn’t even know had her gloves on, and was tagging me in a comment with her perspective. She told me how I need to learn how to have a sense of humour and how people like me make her sick. I was lost…literally clueless. I didn’t even have the foggiest idea where that came from. She literally threw a punch out of nowhere, and I was left dumbfounded. I was oh… what? I need to explain myself…how could she possibly get that…I did not mean that. So I started to write back explaining how I was sorry, I did not understand her comment, and that I was sharing a personal reflection from the quote on that post. And then… ding ding… round two, she threw another punch, telling me… the problem with people like me…and went on from there. I felt my emotions jump into defence position, and my body quickly followed. But suddenly it occurred to me, that I was feeling my thinking about what she was saying. I saw that she was obviously caught up in her own ego-thinking, and she wanted me to jump in with her. I then noticed how she was innocently caught up there, just as I had started to get caught up in my side of the ring. I was experiencing my feelings about what she was thinking about me! Well the irony of it all…given the quote right? What happens with you when you encounter a similar situation? What happens when someone suddenly puts their gloves on, right in front of you? Are you ready to defend yourself, driven by this urgent need to explain what you really meant? Or, do you find yourself freezing up… getting swallowed into the shadows of fear and just want to curl up? Or run away and cry? Or, do you find yourself jumping in there too? 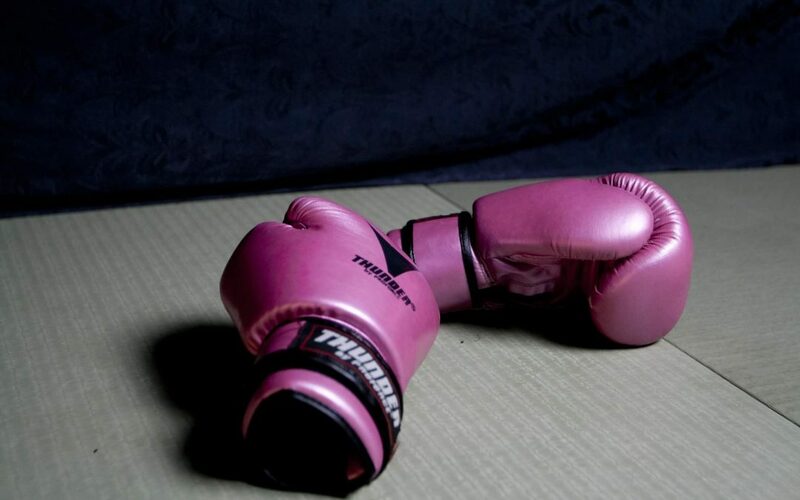 Maybe with your own pink-colored gloves, with your own reality, waiting to take a swing at theirs? I mean, it looks like a good fight, right? And… you know you’ve got this … You know that you’ve got just the right swing to take there… you know you’ll show them… right? Have you ever noticed… just really sat back and noticed: they are just innocently caught up in believing their own ego-thinking? You see, we all constantly get caught in and out of our own ego-thinking… It’s interesting when we are able to see that and hold a separate reality with another person, even when they are caught up in their own. When we can see that the other person has innocently fallen into believing the illusion: that, something other than thought is creating a feeling for them. When we can see that they are lost in believing that: circumstance, situation, or even you… are creating that big feeling for them. In order to hold those separate realities, and to be compassionate here, and be available to notice this truth of how they are experiencing life; we first must be able to see this truth for ourselves. If we are caught up in our own ego-thinking, we can’t possibly see that they are too. We’re feeling our ‘thinking’ about them right now! And, the implication of noticing ‘how’ you are psychologically experiencing this moment right now, allows you to be free from ‘putting your own gloves on’…. or needing to run away, curl up, or hide. It frees you up to be just there, notice it, and to be able to hold that space between you and them. It allows you to see that what’s going on with them has nothing to do with you. It allows you to see that- just as you innocently get caught up in misunderstanding with your emotions… they are just caught up in theirs right now. It’s really amazing, because it frees us up to simply respond -or maybe even not to- in that moment… and it comes from us being in that innate, serene state-of-mind. Coming from our own clarity and wisdom… and what makes sense right now, right here… without being entangled into the illusion of the ‘theirs’ vs ‘ours’ misunderstanding. It allows you to be really available in that moment to what makes sense, and that makes a huge difference in relationships, communication, and in our own well-being. Are you noticing where you are?